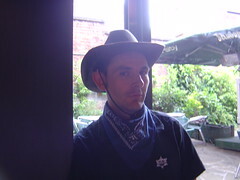 The cowboys rode horseless through York on Thursday night for the Pub Treasure Hunt and drank cowboy drinks, sang cowboy songs and talked cowboy toot. The Cross Keys, The Punch Bowl, 1331, The Last Drop Inn, The Three Legged Mare, Ha Ha and Orgasmic. Not too bad a selection of pubs all things considered. No idea of the results yet. I think we'll have done ok overall but probably not in the top 3.